More than 2,000 tourists have been airlifted by the Mexican army from Acapulco resort, following deadly floods caused by Tropical Storm Manuel. Many more tourists and local residents remain stranded in the city and along the west coast after landslides blocked main roads. Manuel was almost immediately followed by Hurricane Ingrid, causing widespread devastation in eastern Mexico. At least 47 people are now known to have died in flooding and landslides. It was the first time since 1958 that two powerful storms hit Mexico within 24 hours. In Acapulco, the army – helped by local airlines – is continuing to fly stranded tourists, Mexicans and foreigners, to the capital Mexico City. Passengers are being taken directly from shelters to the runway because the main airport terminal remains closed. “I see everybody helping,” said Canadian tourist Michael Paliti, adding that he was “trying to get home as best as possible”. More than 2,000 tourists have already been evacuated, but another 40,000 are believed to have been marooned in Acapulco. “We’re desperate because we cannot return to our city or jobs. But for now, there’s still no hope of returning,” Isabel Duarte, another tourist, said. Dozens of other towns in the south-western Guerrero state have also been hit by Manuel since it made landfall on Sunday. There are fears that remote hillside communities may be particularly affected. Manuel has now dissipated over south-western Mexico. In the east, Hurricane Ingrid was downgraded to a tropical storm shortly before it made landfall on Monday near the town of La Pesca. 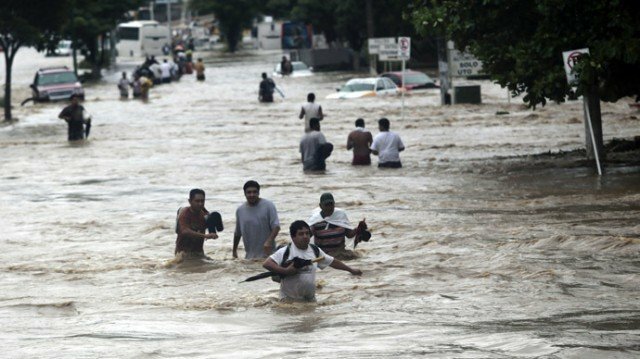 More than 20,000 people have since been evacuated in the state of Veracruz.